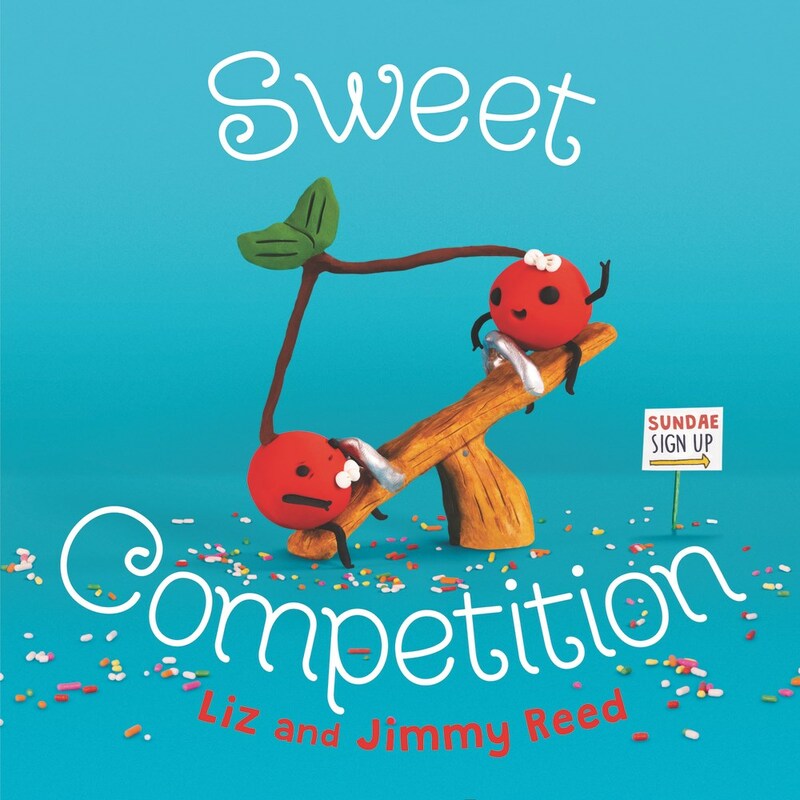 Liz and Jimmy Reed join us to debut the book trailer for their debut picture book, Sweet Competition! Enjoy the video below, then read on to learn more about the inspiration behind the story. 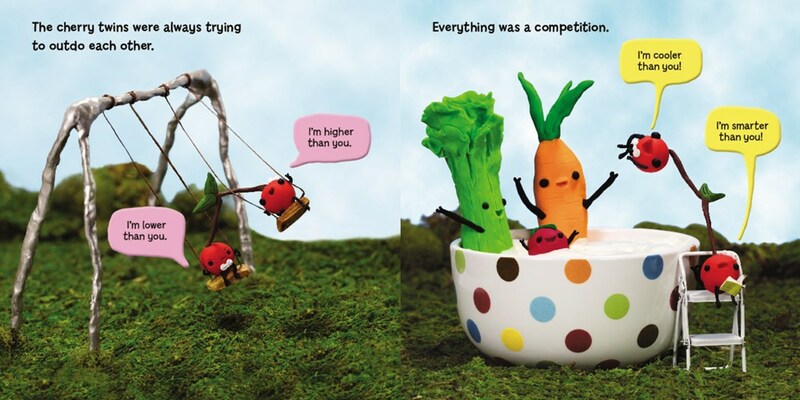 Can you tell us a little bit about the story of SWEET COMPETITION? Liz & Jimmy: SWEET COMPETITION tells the story of the Cherry Twins, a brother and sister joined at the stem. They are always competing and decide to enter a dessert competition to see who is the best once and for all. We both grew up with siblings, so we tapped into our fond memories of sibling rivalry, but also wanted to include a strong message about the value of teamwork. 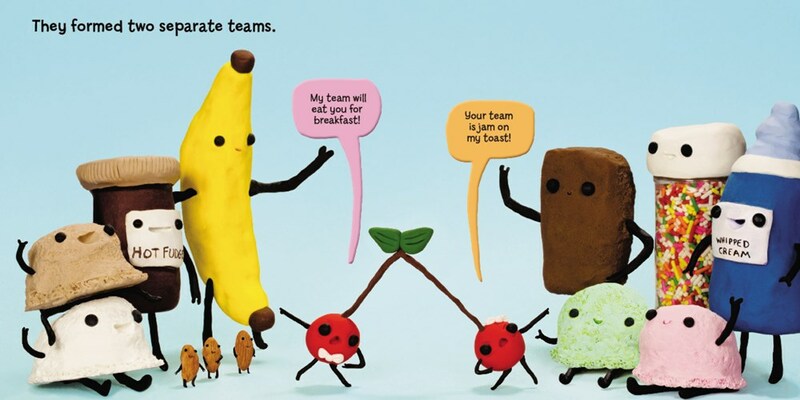 We love the art direction for this story! What materials did you use to make the illustrations in this story? 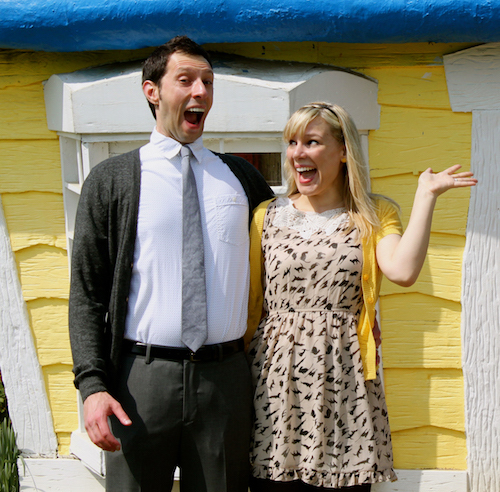 Liz & Jimmy: We used a ton of different materials to make the illustrations – polymer clay, wire, acrylic paint, pastels, liquid sculpey, dollhouse furniture, old clothes, and a little bit of real ice cream. The studio smelled delicious! Liz & Jimmy: We absolutely cannot wait for people to feast their eyes on the grand finale of the sundae competition. We had such a great time sculpting it, we really think it deserves to win the prize! Your book trailer is super cute and has some amazing music. Can you share any of your interests that influenced the trailer? Liz & Jimmy: Well thank you! We wanted to highlight the playful tone of the book in the trailer. We tried to stuff it full of fun colors and ice cream, with a bit of a kawaii influence. We thought it was important to highlight the sculpting process too. In composing the music, we wanted a fun, peppy feel. We are big gamers and pulled music inspiration from Katamari Damacy. That game is the best! The most random inspiration came from Mortal Kombat. The ice cream scoop pop-ups play on Mortal Kombat’s “toasty” easter egg. Liz & Jimmy: Before the book comes out, we should probably clean our freezer. The pool party scene is still in there just chillin’. Thanks for sharing Sweet Competition with us! Sweet Competition will be on sale from HarperCollins beginning November 1, 2016. Liz and Jimmy Reed are the husband-and-wife team behind Cuddles and Rage. 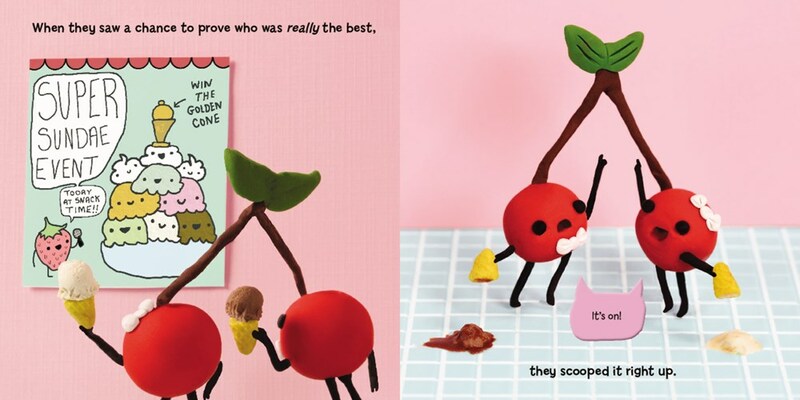 They started drawing it together in 2010 and decided to turn their doodles into a webcomic featuring dioramas of anthropomorphic food. The webcomic appears on the popular site HelloGiggles and has been featured by the Washington Post. Their work can regularly be seen at top pop-culture gallery venues across the nation, including Gallery 1988 and Hero Complex Gallery. They live and work in the DC area, where they frequently share their love of comics through conventions and workshops at local schools. To see more of their sweet work, visit them online at cuddlesandrage.com.